I always start my tomatoes under lights in our seedling room, plenty of time before transplanting them into the greenhouse. I start seedlings in recycled styrofoam coffee cups (or any other free container I can find). They get a great start and they stay in that container until they are root bound. Once that happens, it’s time to get them transplanted into larger containers. One of the most important things I have learned about growing tomatoes is that they NEED to be moved into a larger container at least once. Why? 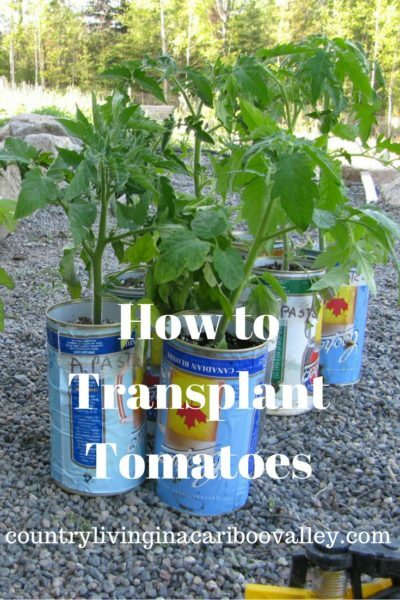 The most important reasons you should transplant tomatoes? 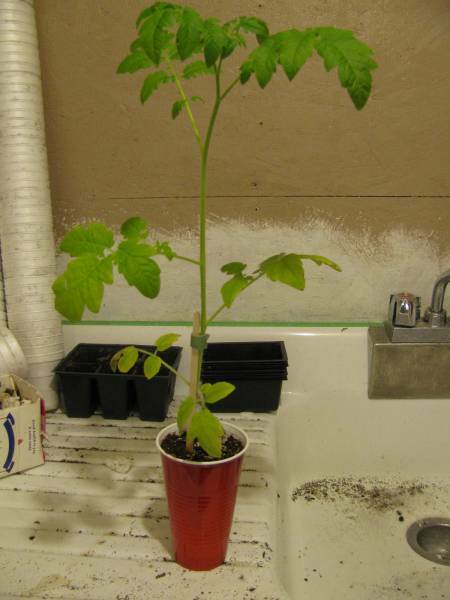 Every time that you transplant your tomato seedlings, you help the stems become thicker and stronger! This is so much better for the fruits that will come along later. 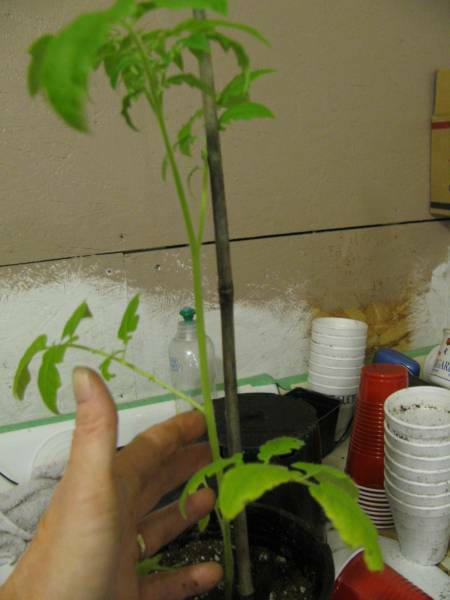 The thick stems and branches will help to support the weight of the tomatoes. Another reason to transplant tomatoes? The healthier the stalk, the healthier the plant. Leggy seedlings will equal leggy plants. Leggy plants won’t yield anywhere near as much fruit. 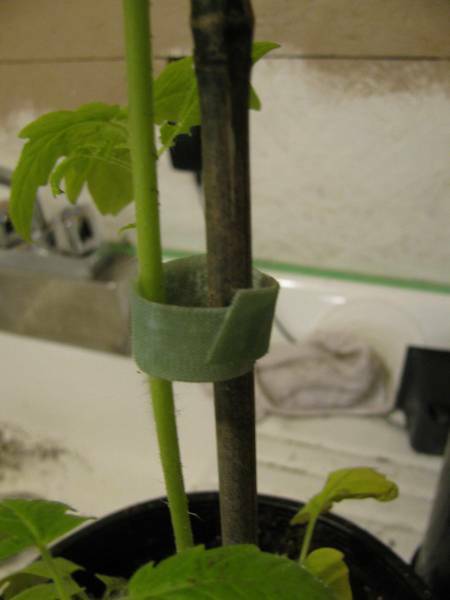 And the whole plant will need a LOT more support by way of stabilizing sticks and ties. See how tall and spindly this plant is? This plant is in desperate need of transplanting into a larger container. It also should have had a stick set in the cup. Tying the stem of the plant to the stick would help support it. A few more days like this and this tomato would probably fall over and break its stem. Who wants to go to the trouble of seeding cups, watering them daily and then just watch the seedling fall over and die? To get ready for the transplanting, I scrub out all the 1 gallon pots I need. It’s really important to wash your containers out before you put another plant into them. Even though we don’t use fertilizers, the containers all still need a good scrubbing. It would be best to do this outside in the warmth and then let the sun dry out the containers. That’s not happening here. It’s too cold outside right now! I put some soil into the new pot and then give it a bit of water. 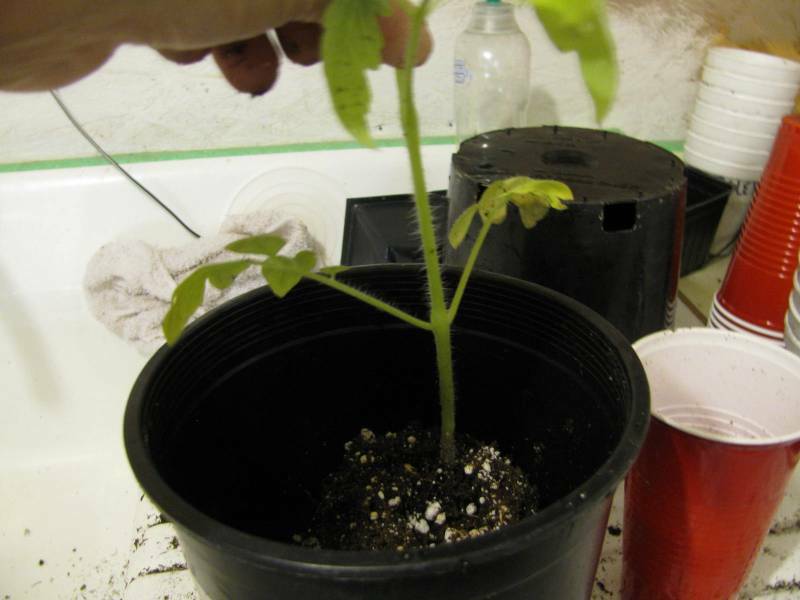 Then I turn my tomato seedling upside down, making sure to splay my fingers on either side of the main stem. I do this to protect the seedling from splitting. Always be sure to support that stem! 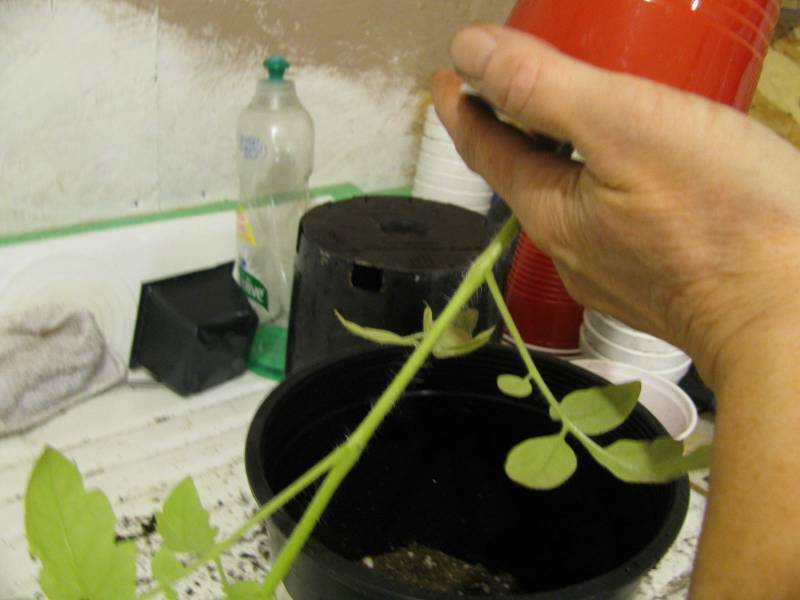 When the plants are this tall, it is really easy to have the seedlings topple over and split their main stem. A nice looking root ball with some roots going all the way to the bottom. I should have watered all of these just before transplanting and you can see that the soil is dry. 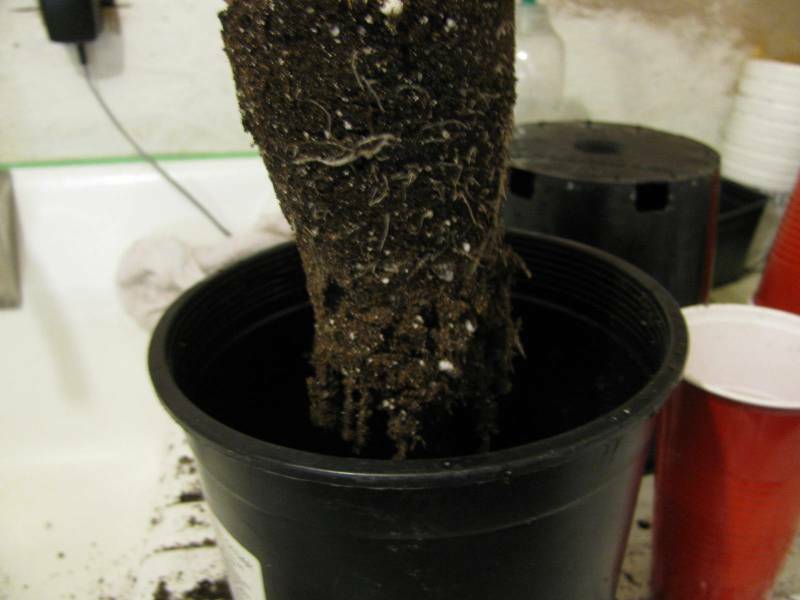 I like to gently pull some of the roots apart so that as soon as they get soil packed around them. This way, they are ready to start growing outwards instead of downwards. 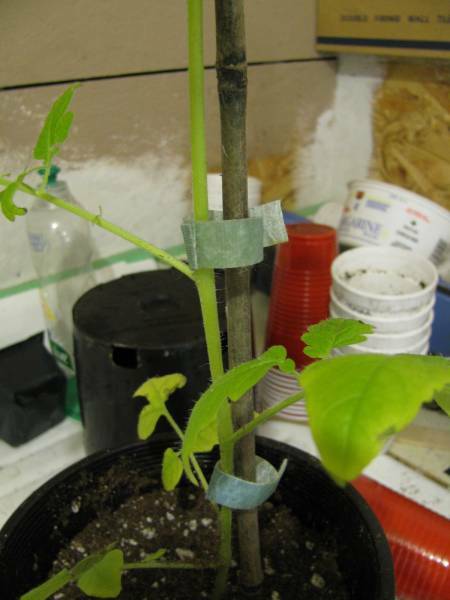 When you transplant tomatoes, pinch off one or both of the lowest leaves on the stem. Doing this means I can bury the stem deeper which will really benefit the plant. The deeper you can bury the stalk, the better. This is why you want to transplant into deep containers. Burying the stalk deeper also means you will have a thicker sturdier central stalk. Exactly what you want. Now it is time to tie the tomatoes to a stake or stick. I’ve just pushed a tall bamboo stake into the pot next to the stem. It’s tall enough that it can stay with the plant right up to transplanting into the greenhouse. Here’s what I use to tie my tomato plants. 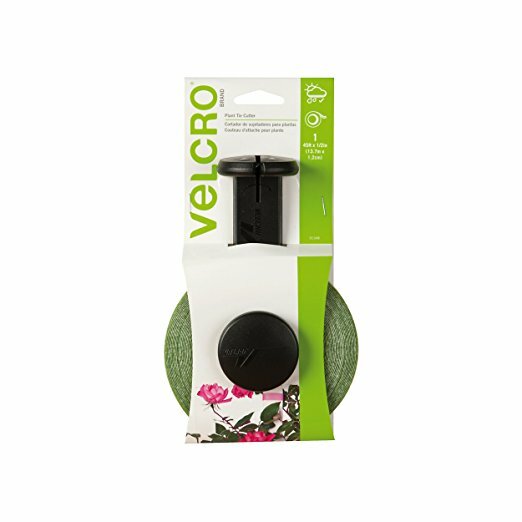 I love using these Velcro plant ties. I can just cut a tie as long as I need. Then I carefully wind the tie around the stake and the plant. At the end of the season, I untie and toss them all in a bag. Put them away downstairs and use them again next year. These ties can be reused for years. I use at least two ties to a plant this tall. Use as many as you need to support the plant all the way from bottom to top. I like to have a few extra ties on there so as the plant grows, and needs more support, I can just move one of those extra ties. I do the same thing once the tomatoes are planted in the Greenhouse. Having those extra ties right there saves me a fair bit of time once the plants starting putting on a lot of growth. See how easy it is to attach the ties? You just wrap the Velcro over itself. The last step is to give each pot a really good watering. Use lukewarm water – never water your seedlings with cold water. Remember that plants go into shock when they are transplanted. Do all you can to get them comfortable as soon as you can. I should have watered both the plants and the soil in the new pot before doing the transplant. 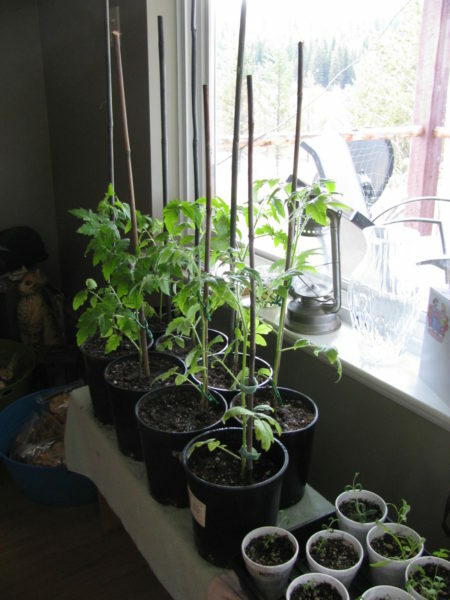 Here are a few of the transplanted tomatoes, back upstairs sitting in the dining room. You can see in this picture how tall those plant stakes are. All that’s needed now is light, warmth and water. These plants won’t go out to the greenhouse for another 3 weeks at the very least. 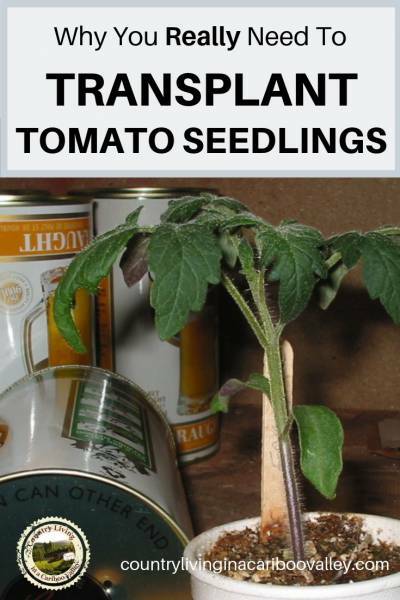 Read here about how to transplant tomatoes into the greenhouse or garden. It pays for us to get a good start on them indoors. You don’t need to spend a lot of money on containers for starting seeds indoors. Here’s what I use as containers for starting seeds. Recycle!